The diagnosis of migraine is made clinically. There are no blood tests, imaging, or electro-physiologic tests to establish the diagnosis (1). The headache must last 4 to 72 hours. The headache must be associated with nausea and/or vomiting, or photophobia, and/or phonophobia. Evidence is mounting that chiropractic and spinal manipulation may provide this sought-after safe and effective alternative. In the modern era of musculoskeletal clinical anatomy, Australia’s Nikoli Bogduk, MD, PhD, is perhaps the most accomplished and respected. A search of the National Library of Medicine using the PubMed search engine with “bogduk n”, locates 259 references (as of May 12, 2017). In addition, Dr. Bogduk has written numerous books, chapters in books, and invited opinion/editorials. His expertise in clinical anatomy has extended for four decades, and continues through today. Specifically, this means that all headaches, including migraine headaches, synapse in the upper aspect of the neck, in a location termed the trigeminocervical nucleus. The brainstem and the upper cervical spinal cord contain a contiguous region of grey matter, the trigeminocervical nucleus. Anatomical and neurophysiological studies show that there is a functional convergence of trigeminal and cervical afferent pathways. 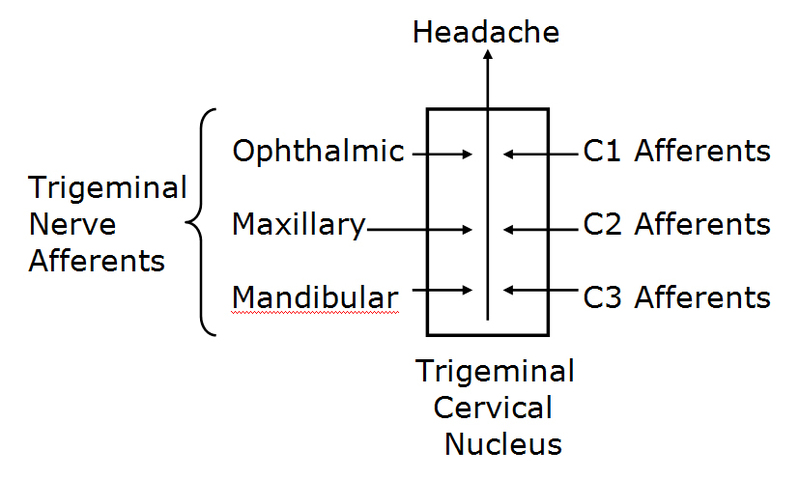 Nerve blocks of the greater occipital nerve [C-2] modulate migraine pain, demonstrating a role for cervical afferents in migraine. There is a functional influence on trigeminal nociceptive inputs from cervical afferents. This study showed that passive manual intervertebral movement between the occiput and the upper cervical spinal joints decreases excitability of the trigeminocervical nucleus. This article supports the clinical anatomical perspective of Dr. Bogduk. It also extends the concept for the inclusion of manual/manipulative therapy of the cervical spine in the management of chronic migraine headache. 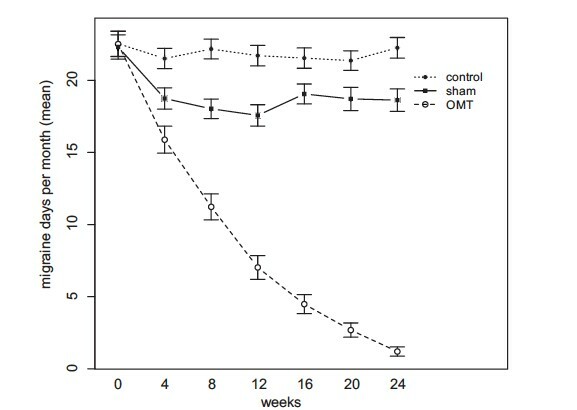 Manipulation + medication therapy (n=35) – The manipulative techniques used in this study included myofascial release, treatment of ligamentous and membrane tensions, treatment of somatic dysfunctions, and treatment to asymmetries and imbalances in the pelvis and cranium. Sham manipulation + medication therapy (n=35) – The sham group received a false manipulation, in addition to drug care. Sham therapy mimicked the manipulative care in terms of evaluation and treatment; it used light manual contact to ‘‘treat’’ the subject. Both manipulative and sham therapy sessions lasted 30 minutes and were given weekly for the first two sessions, biweekly for the subsequent two, then monthly for the remained four sessions. At the end of the study period, there was a statistically significant difference on the overall HIT-6 score between the three groups; the manipulation group was statistically improved from control (drug only) and sham group. The data indicates that the manipulation essentially eliminated migraine days per month, including pain and disability, and reduced drug consumption by 80%. For the group assigned to taking drugs-only, there was essentially no reduction in migraine days per month, pain, disability, and no reduction in drug consumption. The authors note that migraines are a common worldwide challenge, and pharmacological management is often the first treatment of choice. However, migraine drugs can have serious and/or undesirable side effects. In contrast, manual-therapy is a non-pharmacological migraine treatment option that appears to have a similar effect as common drugs on migraine frequency, migraine duration, and migraine intensity. This study used Gonstead analysis, full-spine x-rays, and full-spine adjusting, for patients with chronic migraines. Although this Gonstead adjusting resulted in a few adverse events, they were minor and transient. Additionally, the chiropractic adjusting had the best long-term results. 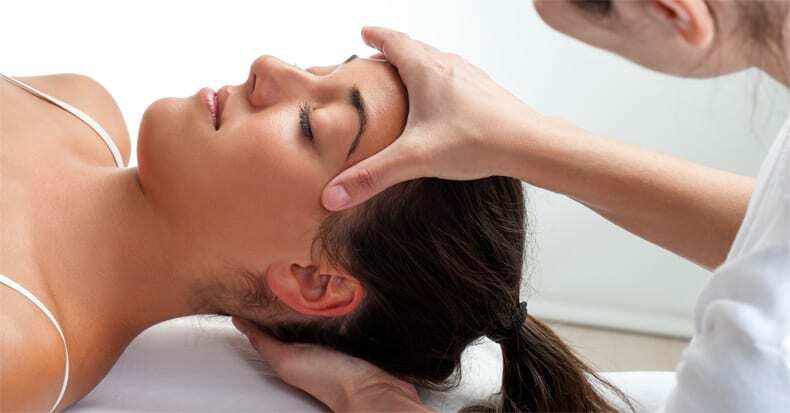 Improvement of the mechanical function of the upper cervical spine with spinal manipulation and other adjunctive mechanical interventions is effective and safe intervention for patients suffering from chronic migraine headache. 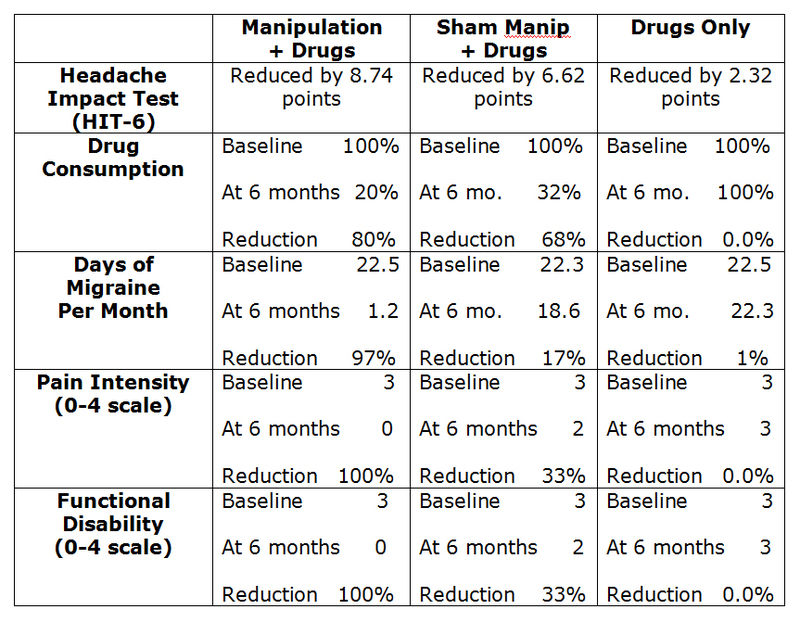 The presented data here suggests that manipulation actually addresses the causative pathophysiology of migraine headache; in contrast, it appears that taking drugs is nothing more than temporary pain control with no improvement to the causative pathophysiology of migraine headache. Olsen J, Tfelt-Hansen P, Welch KMA; The Headaches, second edition; Lippincott Williams & Wilkins; 2000. Jones HR, MD; Netter’s Neurology; 2005. Lee, SM; Huge Headache of a Problem; Mastering Migraines Still a Challenge for Patients, Scientists; San Francisco Chronicle; July 20, 2014; pp. D1 and D5. Bogduk N; Anatomy and Physiology of Headache; Biomedicine and Pharmacotherapy; 1995, Vol. 49, No. 10, 435-445. Watson DH, Drummond PD; Cervical Referral of Head Pain in Migraineurs: Effects on the Nociceptive Blink Reflex; Headache 2014; Vol. 54; pp. 1035-1045. Cerritelli F, Ginevri L, Messi G, Caprari E, Di Vincenzo M, Renzetti C, Cozzolino V, Barlafante G, Foschi N, Provincial L; Clinical Effectiveness of Osteopathic Treatment in Chronic Migraine: 3-Armed Randomized Controlled Trial; Complementary Therapies in Medicine; April 2015; Vol. 23; No. 2; pp. 149—156. Yang M, Rendas-Baum R, Varon SF, Kosinski M; Validation of the Headache Impact Test (HIT-6™) across episodic and chronic migraine; Cephalalgia; 2011 Feb; 31(3): 357–367. Chaibi A, Benth JS, Tuchin PJ, Russell MB; Adverse Events in a Chiropractic Spinal Manipulative Therapy Single-blinded, Placebo, Randomized Controlled Trial for Migraineurs; Musculoskeletal Science and Practice ; March 2017; Vol. 29; pp. 66-71.
WHO, 2005. Guidelines on Basic Training and Safety in Chiropractic. World Health Organization, Switzerland. The post Chiropractic Manipulation for Chronic Migraine Headache appeared first on ChiroTrust.